One of the common reasons for printed circuit board assembly failure is contamination resulting from the fabrication process or environmental exposure to dust, oils or moisture. These contaminants, if not thoroughly removed, can cause corrosion or result in electromechanical migration and parasitic leakages. 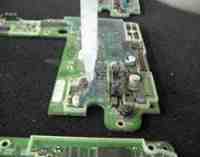 It can also cause complications should the PCB ever need to be reworked. A PCB ionic contamination test detects ionic residues that remain from the manufacturing and soldering process and is often a requirement to ensure ionic cleanliness prior to applying the conformal coating to printed circuit boards. The overall cleanliness of an assembly prior to coating is very important. Conformal coatings are meant to be filters against contamination—if a component already has contaminants on its surface, no amount of coating will protect it from the damage these contaminants can cause. Ionic contaminants have the greatest propensity to cause failures over time. Ionic contamination testing and cleaning successfully removes most all other non-ionic contaminants. The PCB ionic contamination test is conducted using a contaminometer or omegameter to calculate ionic cleanliness. Measurements are completed by releasing the ions into an extraction liquid and calculating the ionic content in equivalent to sodium chloride. Plasma Ruggedized Solutions offers ionic testing to check for conductive contamination on the surface of PCBs prior to coating. This ionic testing will help determine an assembly’s likelihood for electrical or physical failure, and the potential for loss of coating adhesion. Our ionic testing service is a fast, efficient, low-cost method of ensuring the quality of the end product you receive. Ionic contamination testing is performed to industry standards for cleanliness and our commitment to quality assurance. Plasma Ruggedized Solutions uses resistance testing to determine the ionic contaminants present on circuit board assemblies and other components. This assures the highest-possible quality of the products we receive for coating. An ionic cleaning service to complete the process. After cleaning, we retest the components to verify success. Ionic testing can be conducted at various points in the conformal coating process as a quality control tool. We are committed to providing the highest level of quality in the conformal coating industry and have established various quality assurance measures including quality certifications and policies. Read more about our quality assurance for conformal coating and commitment to providing service that meets or exceeds our customers’ expectations. We offer ionic contamination testing prior to our in-house conformal coating processes, but the ionic testing services are also available to customers who wish to test the quality of the products they’re receiving from contract manufacturers. We can usually deliver same-day or 1-day turns for ionic contaminant testing. This is a quick, inexpensive way for our customers to determine the level of cleanliness they’ve received before continuing their production processes. Our ionic testing services are ideal for high-level, non-standard products, including assemblies used in military, aerospace, medical, solar energy, and other non-consumer industries, and for long-life consumer products. Plasma Ruggedized Solutions’ ionic contamination testing is an extremely safe, efficient test method for PCBs and other products. The methods and chemicals used are all environmentally friendly, creating an exceptionally green overall process. Our ROSE (Resistivity Of Solvent Extract) testing procedures meet or exceed all applicable industry standards for cleanliness, including MILC-28809, IPC 600, IPC 610. Read our Whitepapers to learn more about our industry services and capabilities related to conformal coating and other plasma applications. We also have a number of case studies with examples of how we have resolved a multitude of challenges across a wide range of industries. Contact Plasma Ruggedized Solutions today to discuss our ionic contamination testing services. In addition to ionic contamination testing, we also offer testing and laboratory services including environmental stress screening, Hi-Pot testing, cross sections and two-dimensional X-ray diffraction.